Ann Allen famously did not like the city that would bear her name but, to be fair, she dealt with muddy streets, roaming hogs, and the inability to vote. Maybe she would like it better now, what with air conditioning, top ranked restaurants, a university, and the ability to wear pants and speak freely. But maybe she wouldn’t, because we don’t know much about her. Much is known about city co-founder John Allen, but what do we know about Ms. Ann Isabella Barry McCue Allen? Originally named Agnes, our future Founding Mother lost her own mother just nine days after her birth on Jan 22, 1797. Overcome by his wife’s death, Agnes’ father tried to get his Irish family to come to Staunton, Virginia to help him raise his newborn. The family declined and a local woman was hired to care for baby Agnes. At some point, Agnes’ Virginia based aunt, uncle, and grandmother stepped in to help raise her. Three years later after Agnes’ father died and her family began to call her “Ann”, after her late mother. The family groomed Ann to become a “Southern Lady”, which was expected of a girl with the social station—and inheritance—of Ann Barry. 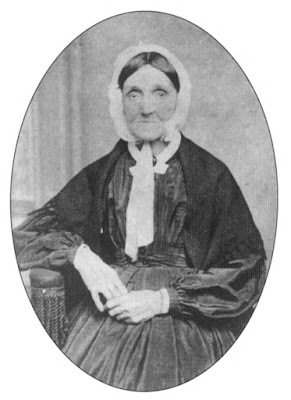 The Southern Lady lived with McClure’s brother and wife until Ann married a gentleman farmer and doctor named William McCue when she was 16; by the age of 21, Ann was the mother of two sons and a widow. Three years later, she married 25 year old John Allen, a widower with two children of his own. History records this marriage as one of convenience—Ann needed a provider and father for her children and John needed a mother for his children. Additionally, the personalities of the young couple could not have been more different. John was what we might now call an extrovert—very self confident and friendly while Ann would be considered a introvert, a shy woman who preferred to keep her private life private. After the wedding on June 7, 1821, the Allens moved to John’s farm in Middle River, Virginia while Ann’s two sons remained with their paternal aunt and uncle. Two years after the marriage, John headed off to find fame and fortune (and to avoid some debts). His journey took him to Baltimore, Buffalo, and finally Michigan. Meanwhile, Ann remained behind to care for John’s children and their newborn daughter, Sarah. Although Ann eventually moved back to live with her sons, her former in-laws obtained guardianship over both boys. In August of 1824, Ann received a letter from the Michigan Territory. In it were instructions and directions on how to join him in his new settlement. The plan was for Ann, Sarah, John’s two children from his first marriage and John’s parents to travel by covered wagon. But what of Ann’s two sons from her first marriage? Heartbreakingly, Ann’s wealthy former brother-in-law asserted his guardianship over his nephews and demanded that they remain in Virginia. Ann is reported to have felt extremely guilty, even though she had no control over the situation. Ripped away from the comforts she had grown up with, Ann now faced life as a frontier wife. Pop culture tends to view living on the frontier through rose colored glasses and surely there were joys and advantages to that life. But Ann grew up wealthy; her birth family owned slaves and property. While this idea if abhorrent, it is important to remember that Ann herself owned nothing—even her dowry was immediately handed over to John Allen to do with as he saw fit. Still, she received the benefit of wealth and slave labor and avoided daily household chores and tasks that poorer women had to endure. At the time, there was not the understanding of clinical depression nor were there services to aid her. It is unclear how she spent the years after the financial panic. Help finally arrived when her son Thomas McCue came to Ann Arbor in 1844 to fetch his mother and half-sister, Sarah. The family returned to Virginia where Ann lived out the rest of her life. While she was finally away from a town she hated, Ann still had to endure the Civil War and the death of both of her sons. Ann passed away at her daughter’s home in New Hope on November 27, 1875. I think you mean the panic of 1837. Interesting history, though depressing.